The north track has been closed and blocked off with large boulders to prevent fly tipping, as of 27/9/2017 it CLOSED. Both access tracks are rough anyway, the north being the roughest. It is best to use a vehicle with high ground clearance or ideally someone elses – sumps have been lost in the past. The south entrance is located at co-ordinates N51.674630, W003.330329. This is located on the A4054 (Cardiff Road). The entrance is located 0.19 miles south of Merthyr Vale and 0.82 miles north of Edwardsville from the point where you exit the residential areas. At the track junction travel 3.75 miles up the rough track to the top of Merthyr common and turn left off road to the Parking area. Ensure you indicate early for the south entrance to minimise any potential road incidents as the turning is sharp, not sign posted and in a national speed limit zone. Park as per map above. Either in front of the mound south of the north most end, Or alongside the SW/NE track to the north of the Hang Glider top landing area. Cars parked just behind the take-off. Photo courtesy of Marcus Woodbridge. 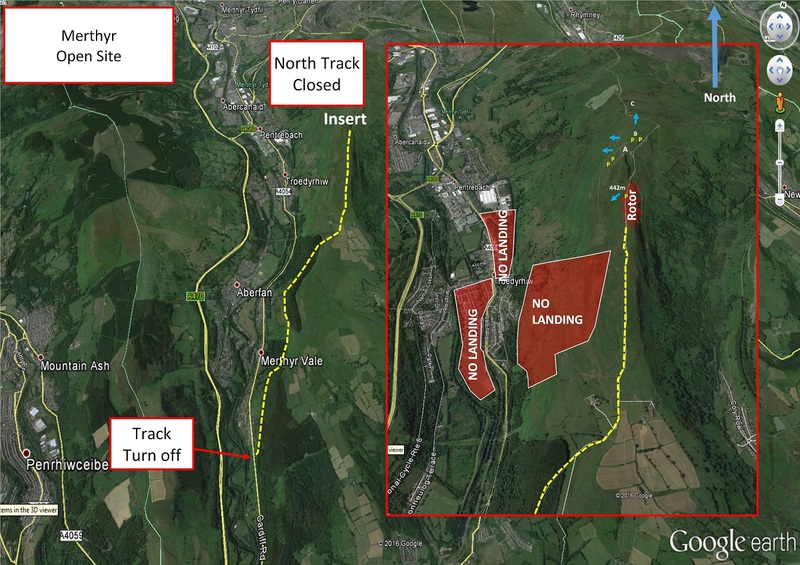 The north track has been closed and blocked off with large boulders to prevent fly tipping, as of 27/9/2017 it CLOSED. The south track open but quite rough, take great care or someone elses vehicle. ordinates above. Basically aside the northerly most track, or in front of the mound as per the P’s on the map image. North: This take-off is mainly used for training top-to-bottoms and can only accommodate 1 or 2 wings. Southwest: A shallow take-off for hang gliders from the top of the ridge. Watch out for paragliders launching lower down. A view of the Merthyr Common take-off (nearly anywhere along the ridge). Photo courtesy of Marcus Woodbridge. frequently used for ab-initio training so keep a sharp lookout for beginners and try to land to the east of the track. 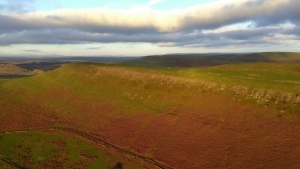 A view of the Merthyr Common ridge – note the bracken was brown at this time of year. Photo courtesy of Marcus Woodbridge. Looking north along the Merthyr ridge in the evening sunset. 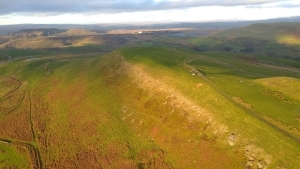 You can see the open cast mine to the north (top) and also Mynydd Fochiw (another paragliding site) to the east (right of image). Photo courtesy of Sparky Mark Baldwin. A friendly site generally. 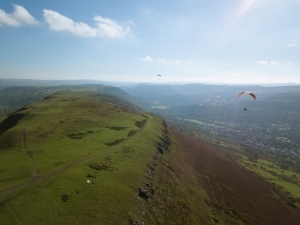 The main ridge has a large capacity and can support more than 50 gliders in good conditions. paramotors taking off or landing at Bedlinog. 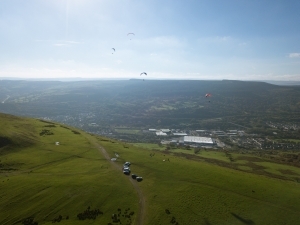 An image of flying off the Merthyr Common ridge looking south. Note that thermals can trigger off the higher mound just behind the ridge. Photo courtesy of Marcus Woodbridge. and strong sink in the lee of the hill. Do not land too far back. 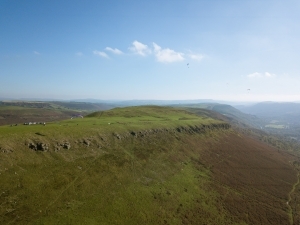 An overview of the Merthyr ridge – careful of the rocks and sharp wind gradient due to the shape of the terrain. Photo courtesy of Sparky Mark Baldwin. Do not land in the sports field adjacent to the railway line, unless it’s an emergency. HG – Carl Wallbank flew 338.73km on a Moyes Rx 3.5 on 24th June 2015. PG – Karoly Megyesi flew 169.7 km on his Niviuk Icepeak 7 Pro on 23 July 2015. 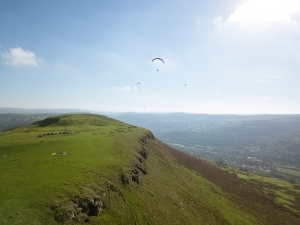 A pilot leaves Merthyr Common across the valleys and over other flying sites including Mynydd Fochriw, Pontylottyn, Abertysswg (Mynydd Bedwellte), Ebbw Vale, Mynydd Carn-y-Cefn (of the Blaina ridge), Blaenavon (Coity Mountain) and finally the Blorenge. For retrieves the nearest train station is Troed-y-Rhiw on the Merthyr Tydfil line (although you may have chosen to leave a car at Merthyr Vale station instead). Merthyr Common East of the A470. 4.48km South East of Merthyr Tydfil. Your nearest hospital is Prince Charles Hospital, Merthyr Tydfil.